Wrapper: Dark Ecuadoran Sumatra. Filler: Honduran, Nicaraguan, Dominican (Piloto Cubano). Binder: Connecticut Broadleaf. Country of Manufacture: Honduras. Factory Name: Honduras American Tabaco S.A., Cofradia, Honduras. -- The history: The original Hoyo de Monterrey was the 1865 inspiration of Jose Gener, one of the most respected growers in Cuba?s famed Vuelta Abajo. Since the early 1970s, an equally illustrious Hoyo de Monterrey tradition has been firmly established in Honduras under the masterful guidance of cigar master Estelo Padron. 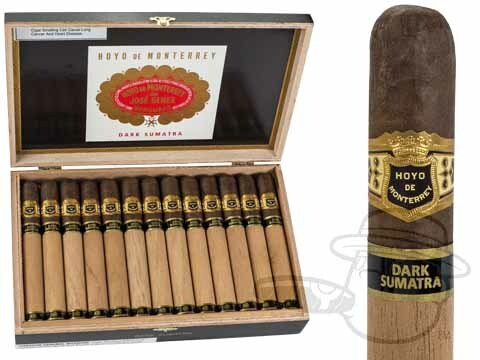 Now, the new Dark Sumatra cigar takes Hoyo de Monterrey to a new level with an even richer, more robust flavor than that for which Hoyo has become renowned. The cigar: Dark Sumatra is named after its wrapper tobaccos, hand-selected from the very darkest and richest Ecuadorian sun-grown, Sumatra seed leaves. Dark Sumatra also has a rich, textured CT Broadleaf binder and a special robust blend of premium Honduran, Nicaraguan and Dominican filler tobaccos that all contribute to the extraordinary taste of this new Hoyo de Monterrey cigar. The experience: A full-bodied cigar, even more robust than a regular Hoyo de Monterrey, Dark Sumatra promises one of the finest tastes to come out of the Honduras. Consistently good, well made and a very tasty mild cigar. Hoyo De Monterrey Dark Sumatra Noche is rated 5 out of 5 based on 3 customer ratings.